Eight small cabins, accessible only by boat, are scattered over the thousands of acres of the state-owned Mad Horse Creek Wildlife Management Area and adjacent private land. There is no record of the origins of the first cabins; but undoubtedly, they dated back to the nineteenth century, if not earlier. Shelters for watermen caught in a storm or wanting to stay close to the source of their livelihood, would have been necessary wherever fishing, trapping, and hunting were a way of life. 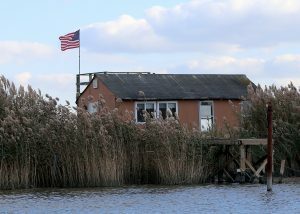 The existing cabins, which date back to at least the mid-twentieth century, are simple vernacular structures of about 200 square feet, built on pilings, and accessible from the water by means of floating docks. They generally consist of a single room, have no electricity, and use creek water for cleaning fish or washing hands and dishware. 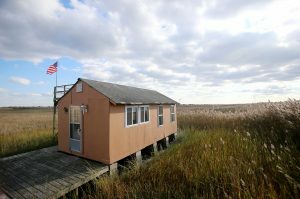 The NJ Department of Environmental Protection (DEP) claims the cabins were built since the state acquired the land on which they sit (three in 1985 and one in 2001), despite what the owners of the cabins say. Following an anonymous tip about the cabins in 2017, DEP planned for their demolition to begin in late January 2018. The DEP had awarded a $250,000 contract for the work, and the contractor had equipment in place when Catherine McCabe, the DEP’s new commissioner under the Murphy administration, halted work until the issue could be reviewed. The cabins have wide support in the Bayshore communities of Salem and Cumberland Counties; so much so that in some neighborhoods, almost every residence sports a red “Save the Cabins” yard sign. The Salem County Board of Freeholders approved a resolution calling for a stay of demolition, which they consider to be an important piece of rural Salem County history. The NJ Senate and General Assembly have introduced legislation to save the cabins (the legislation has not been approved or signed by Governor Murphy). Commissioner McCabe made a first-hand assessment of the cabins on April 19th along with State Senate President Stephen Sweeney and Assemblyman John Burzichelli; but, did not indicate what her decision would be. The DEP has not stated the length of time anticipated for the review, which could result in the restart of the demolition process at any time. The significance of the cabins lies in their contribution to the cultural landscape of the creeks and marshes, and the historic folkways they represent. They are the remnants of what were once scores of similar structures and represent the vanishing way of life of the region’s watermen. This way of life still includes an open-door policy that means the cabins are never locked and are available to anyone in the area who needs a place of refuge in a storm, or just a place to relax. Log books with hundreds of entries record appreciation for the use of the cabins by friends, neighbors, and strangers. The DEP has a policy of demolishing buildings on land it acquires for open space preservation and is often obdurate in its refusal to retain any structure, no matter how historically or culturally significant, unless protected by listing on the NJ Historic Register. The cabins, though not as architecturally significant, are culturally and historically significant, and are of great importance to the surrounding community. The DEP should adopt a policy of treating register-eligible structures with the same review process that is used for structures already on the register and should be sensitive to the cultural landscape and folkways manifested in the properties it acquires. 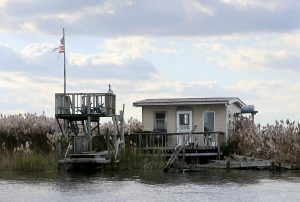 PNJ urges DEP to permanently reverse its demolition order, and work with the cabins’ owners to arrive at an acceptable compromise for their preservation. The owners have said they would be willing to pay rent for the land and make other environmental changes required by the DEP if they can keep their cabins.